What an awesome blossom. Once you slip on this ring, resplendent with vibrant tanzanite and glittering topaz, your style is ready to bloom. Let it be the accessory you reach for to dress up lacy frocks, bell-bottom jeans and button-front blouses. 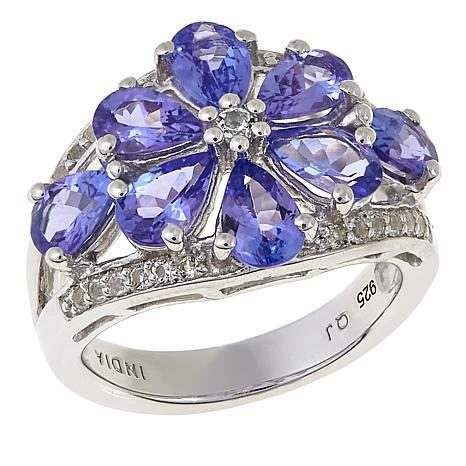 Sterling silver ring has flower-like design, comprised of prong-set, pear shaped tanzanite "petals"
This must be rated a AAA because mine was deep in color and absolutely breathtaking. Hard to find this deep in color without paying a fortune now. This was a bargain. Will add and keep for my collection. But of course I will wear to show it off. It's stunning! This ring is so pretty!! I love the color, the style & the comfort. I highly recommend. The Color on this ring is absolutely stunning. I can understand why this has been a past customer pick and I am sure it will continue to be one. I have received many compliments when wearing the ring. I am also happy to say that I appreciate Colleen's recommendations when it comes to great finds like this that "Color my World". This is a great addition to anyones collection at a good price point. 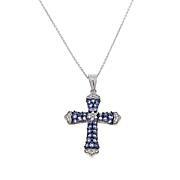 I love looking at the vibrant color and color changing properties of the tanzanite. 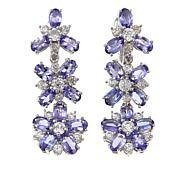 I was pleasantly surprised when I opened the box and saw the beautiful color of the Tanzanite stones. 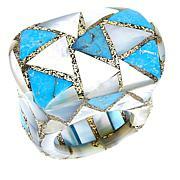 The ring is well balanced, comfortable on the hand, low profile, and very attractive. The sale price was a bonus and this is the first Tanzanite ring I haven't returned due to pale Tanzanite. Very pretty and a keeper.